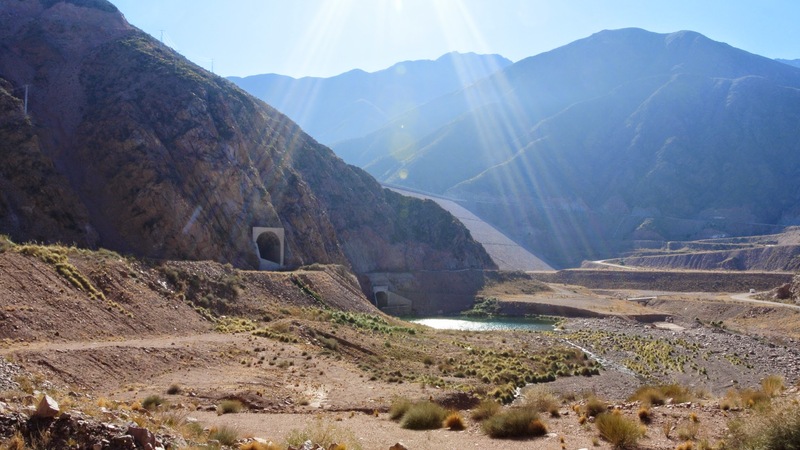 This is the third and final post on the hydrological system in Mendoza, Argentina. While much more could be written, even from the little bit that I've learned, this short series is focused on three large, public (though not necessarily accessible) landscapes that are essential to the system. I am interested in these places as important, interrelated landscapes that might become even richer, more meaningful, and more efficacious if considered together as significant cultural landscapes. Today, I want to try and capture something about the Embalse Potrerillos (Potrerillos Reservoir). 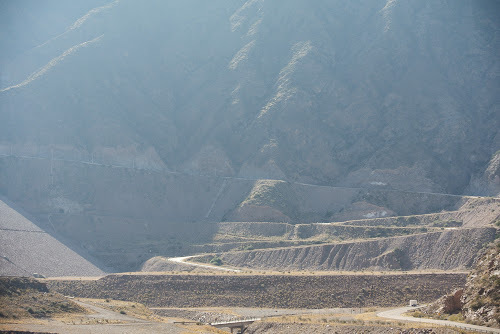 Located 30 kilometers southwest of the city, where the Mendoza River begins its descent from the Andean precordillera, the Dique Potrerillos is a massive concrete-faced rockfill dam. It was built by a private consortium between 1999 and 2003 to generate hydroelectric power and ensure a stable water supply for the growing city as its glacier-fed river shrinks. 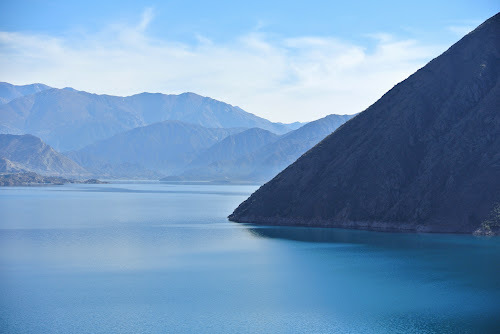 It is really the largest and the last (farthest upstream) in a series of dams, canals, aqueducts and turbines that intensify and capture the energy and water of the Mendoza River. The first of these is the Dique Cipoletti, a diversion dike that pushes the remnants of the Mendoza River into the Guaymallén Canal for use in irrigation, and perhaps the most important and complex is the Dique Las Compuertas complex, which provides much of the city's drinking water, hydroelectric power, and cooling for the YPF (national oil company) refineries nearby. In some ways the Embalse Potrerillos needs no introduction as a cultural landscape. No one needs to be told that it is already a place that possesses a breathtaking character in that Andean way- jagged, bare, muscular mountains diving straight into perfectly blue water. And unlike the Campo Espejo it is readily accessible to people in the region, thanks to Highway 7 which runs along the more winding topography of its southern edge with scattered stopping point to lookout over particularly sublime configurations of mountain and lake. No motor boats are permitted here, but people use the water for cleaner, quieter forms of recreation such as sailboating and kayaking. But seen only in this way, the landscape is incredibly deceptive. Missing is the ability to appreciate the great earthworks and engineering that both created this landscape and enable urbanism on the plain down below. The reservoir provides a primary intake for two power plants that produce 20% of the city's annual electricity consumption and ensure that there is water for treatment plants located further downstream. It also appears to be incredibly stable and timeless. This appearance belies the fact that this is a landscape that is in extreme and constant change, a set of processes that the dam landscape and dozens of interesting apparatuses and management practices attempt to modulate. 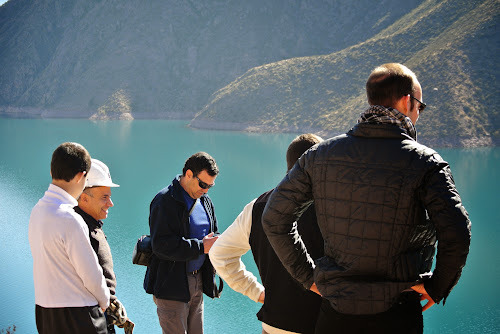 The waters behind the dam begin deep in the Andes Mountains where shrinking glaciers are fed by snow falls that have been shrinking over the last decade. Monitors in this area constantly report back information about snowfall and temperature to the water and sewer authority so that predictions of available water can be made for the coming year. The Mendoza River is a sediment-heavy river, picking up massive loads of sand on its way downhill, which it promptly deposits near where it empties into the Embalse Potrerillos (for proof of this, just check out the difference in water color at the confluence of the two). At the other end of the Embalse, the dam is equipped with a tunnel that can be opened in order to flush out deposited sediment that has accumulated behind the dam. This occurs often, and requires coordination among the private enterprise running the dam and multiple government agencies so that the intakes downstream on the Mendoza River can be temporarily taken offline, as the sediment content can choke out the machinery. However, this management technique does little for the larger, sandy sediment deposited at the confluence. As a result, the fluid capacity of the reservoir has decreased by about 1/3 in just 10 years. This reduced capacity has lead to concern regarding the dam's ability to modulate the large floods that occur sporadically on the Mendoza River. The region is also a highly active seismic zone, a fact which required a large earthen platform to be constructed on the backside of the dam to stabilize the base before the reservoir could be filled. What appears to be a beautiful place where the river has been tamed is actually a situation where the biological and geological processes been extremely intensified: no sedimentation appears to be occurring, until it is flushed down the river in one mighty pulse, or until it fills up the entire reservoir; the river appears to now run in a very limited, regular fashion, until it disappears behind the dam altogether because of hydroelectric use, or overwhelms the spillway because of the reduced capacity. In this way the Embalse is a landscape as described by JB Jackson- it is a place that has been created to speed up and slow down processes of nature. It seems to me that any future attempt to understanding these additional facets of this place as part of the cultural landscape must deal with a few key questions- sediment, access, and representation. New devices or techniques are needed at the confluence to deal with sedimentation. This could be a series of check dams, wing dams, and a temporary draw down on water during high flow seasons (summer) that allows for the previous years deposits to be collected and excavated without using combustible engines on the water. In addition to creating a series of habitable structures that could serve as boat launches and fishing spots during the rest of the year, the exposed flats that aren't being excavated could provide temporary beaches during the summer. At the other end of the Embalse, the private consortium CEMSA, comprised of IMPSA and Cartellone, who built and run the dam and will maintain control over it for ten more years maintain highly restrictive policies with regard to accessing the dam and the Mendoza River Valley immediately downstream (where all of the cool stuff is) because of fear of damage to critical instrumentation such as seismic monitors. This is for good reason, but in the future the provincial authorities should work with the consortium to allow for specific types of access. This includes technocratic access, to ensure the necessary level of coordination occurs when the sediments are being flushed (it doesn't always, which causes damage and service interruptions). But also more general access, perhaps starting specifically opening up small areas near the dam when a flushing event is occurring. This kind of targeted specific access would be manageable, and would allow inhabitants of the city to have an unusual aesthetic experience- the rumble and gush of the pent-up river moving through a striking techno-geological landscape. Perhaps more importantly, it would allow inhabitants of Mendoza to understand on a visceral level that the water that is so critical there is not produced through magic, or supplied by nature, but rather is the result of a difficult and exciting dance between the river, its sediment, and human ingenuity and desire. This type of attractive experience, if it occurred at a similar time of year, could become a cultural marker like the important and lovely grape harvest festivals that occur throughout the wine-producing region. In addition to simply being fun, and awesome, and perhaps an additional source of local revenue, over time this type of cultural experience can build the political will that will be necessary in the future to make the necessary changes as the region's water supply further diminishes due to the changing climate.